Bennington College received a A.
Washington Monthly's ranking of 213 out of 224 of Affordable Elite Colleges - Overall Rank was a major contributor to this grade. "Bennington College is a small, progressive, very arts-oriented and "creative" liberal arts college that offers students the opportunity to put together their own programs. Classes are more akin to intimate seminars and instead of grades and tests, Benningtonians receive written evaluations of their work. Nearly weekly theme parties provide the bulk of campus entertainment." What are the top 3 reasons someone should attend Bennington College? Individualized learning. You write your own major. Faculty work with what students want to learn and not the other way around. What is a typical Bennington College student like? Describe the type of person that should attend Bennington College. Each Bennington student is passionate. If you want to throw yourself into a world where all of the liberal arts mingle together to make a unique degree for each student, then this school is for you! Known for top-notch performing arts and lavish attention on every student. One of the biggest draws is a seven-week winter term during which students take internships at various institutions across the country and the world. A campus visit...is strongly recommended as an excellent way to demonstrate your interest in the school. Very intimate college experience, where grades are optional but academic experiences can still be intense. 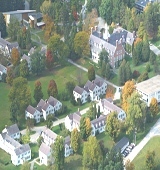 Bennington holds a distinguished place among American colleges and universities. It was the first to include the visual and performing arts in a liberal arts education, and it is the only college to require that its students spend a term--every year--at work in the world. Rooted in an abiding faith in the talent, imagination, and responsibility of the individual, Bennington invites students to pursue and shape their own intellectual inquiries, and in doing so to discover the interconnection of things. What are the top 3 things that students do for fun at Bennington College? See student and faculty performances! There are always new projects to see and people that you know in them! The average student pays $34,583 for tuition, fees, and other expenses, after grants and scholarships. Total stated tuition is $44,490, in-state and on-campus, before financial aid. Learn more about financial aid at http://www.bennington.edu/admissions/financialaid/financialaid.aspx. Estimate the net price for you at http://www.bennington.edu/admissions/financialaid/netpricecalculator.aspx. Want more info about Bennington College? Get free advice from education experts and Noodle community members. Does Bennington College have counseling services?